If you’re the parent of a 5 year old, your child probably loves jokes. My daughter is currently obsessed with jokes, but I quickly realized that finding the perfect jokes for 5 year olds was not an easy task. Sometimes it’s hard to find jokes that she can truly understand. She’s constantly asking Alexa to tell her a joke, but a lot of the jokes are over her head, and some are not very appropriate jokes either. 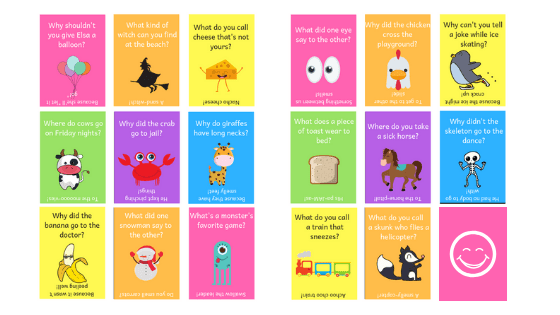 Not all jokes for kids are easy to understand, and when I looked for jokes for preschoolers, I found some really hilarious and perfect jokes for 5 year olds that kids of all ages would love. The following are jokes that make the cut. 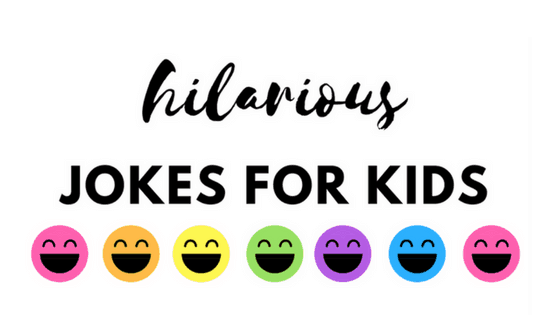 They are simple enough for your preschooler, but they’re also some of the best kid friendly jokes that I’ve found. These children’s jokes will have the whole family laughing together. So check out the jokes below or gather your kids and watch this video, which gives you a chance to play a little game and see who can come up with the joke’s answer first! This post may contain affiliate links, which come at no extra cost to you. Because she’ll “Let It Go”! What kind of witch can you find at the beach? Cows go. Cows go who? No, cows go MOO! What do you get when a witch goes to the beach? Where do cows go on Friday nights? What did the mommy tomato say to the baby tomato? Why did the crab go to jail? Because he kept pinching things! Because he wasn’t “peeling” well! What animal needs to wear a wig? Because they have smelly feet! What goes black, white, black, white, bump? A penguin falling down the stairs! What’s a monster’s favorite game? What does one eye say to the other eye? What do you call a train that sneezes? Why can’t you tell a joke while ice skating? What’s mommy and daddy’s favorite ride at the carnival? How did Cookie Monster feel after eating all the cookies? What do you call a skunk who flies in a helicopter? What do you get when you shake a cow? What do kittens like to eat? What did the ocean say to their airplane? Boo. Boo who? Don’t cry, it’s only me! What do you call an eagle at the bay? What’s a dinosaur called when it’s sleeping? What did the cookie say to the annoying cookie? Why did Mickey Mouse go up in space? What does Olaf eat for lunch? What letter is always wet? Breastfeeding mom bonus* What kind of bees make milk? Don’t forget the printable version! You can keep it anywhere around the house. I keep ours in the car and I tell jokes while we’re waiting for the van in the morning. What easy kid’s jokes did I forget? Love this! My kids love jokes, but theirs make NO sense, and they don’t get a lot of the ones I tell them. I’m excited to teach them some of these. So glad you like it! My daughter makes up jokes ALL the time and they don’t make sense at all. ? She thinks they’re funny at least. I can’t wait to share some of these with my little guy! Thanks! These are so cute and funny! Will have to tell some of these to my son niece and nephew. I’m sure the will love them. Kids love jokes! It really is! My daughter desperately wanted to laugh at jokes, but with most jokes she was faking it, haha! Right, it’s not just for preschoolers! These are so cute. I shared some with my 5 year old and there was lots of giggles. Aww! My 5 year old loves them, too! No problem! Everybody loves a good, clean joke ? Haha, I will have to share these with my daughter! I do love it and I did Pin It! Such a cute idea, since you’re right, most jokes are over their heads! I love some cheesy humor, so I actually got a nice chuckle myself! haha these are so good! I need to save them for later!